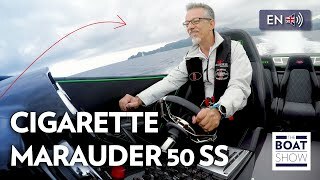 Mercedes and Cigarette Racing collaborated to create a special Cigarette boat, the Black Series 50 Marauder Cigarette boat, which was introduced at the recent 2012 Miami Boat Show (Feb 16-20, 2012). The Black Series 50 Marauder has its design inspirations from the C63 AMG Black Series, which is the most powerful C-Class of all time with a max power output of 510hp and a max torquer of 457 lb-ft. The boat features striking black and white design scheme is carried throughout from the Mercedes color-matched paint to the all-newly designed interior, upholstered with luxurious Alcantara. Powered by two Mercury Racing 1350 (2700 total hp.) engines, the boat's speed is matched only by its smooth efficiency, running on pump fuel, without headers, with a warranty, combining for an exciting day on the water for the most discerning performance boat aficionado. While each brand's products always exemplify the ultimate in performance and luxury, the Mercedes-Benz C63 AMG Black Series and Inspired by AMG "Black Series" 50' Marauder represent the next level in excellence. Arriving in U.S. dealerships this April, the C63 AMG Black Series is the most powerful C-Class of all time, boasting a maximum output of 510 hp and a maximum torque of 457 lb-ft. The high-revving AMG 6.3-liter V8 delivers a 0-60 sprint in just 4.2 seconds and a top speed of 186 mph. Introduced at the 2012 Miami Boat Show, the Inspired by AMG "Black Series" 50' Marauder features striking black and white design scheme is carried throughout from the Mercedes color-matched paint to the all-newly designed interior, upholstered with luxurious Alcantara. 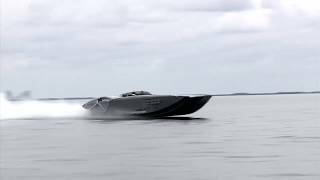 Billet aluminum pieces -more than 100-are integrated throughout, customized for the AMG Black Series boat, incorporating a new formula of anodizing and corrosion resistance. Billet is featured on the dash, grab handles, seat supports, sound system and in numerous trim accents. Powered by two Mercury Racing 1350 (2700 total hp.) engines, the boat's speed is matched only by its smooth efficiency, running on pump fuel, without headers, with a warranty, combining for an exciting day on the water for the most discerning performance boat aficionado. Founded upon mutual respect and product admiration, Mercedes-AMG and Cigarette Racing have developed a long-standing professional relationship. 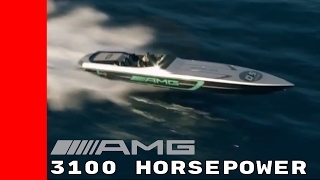 In 2010, Cigarette Racing revealed the "Inspired by AMG" 46' Rider, inspired by the SLS AMG. 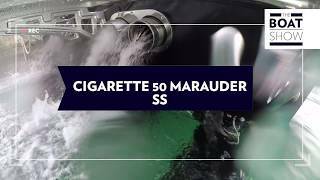 The Cigarette 46' Rider featured hand-applied AMG ALUBEAM silver paintwork, also available on the SLS AMG. This process, used exclusively by AMG, covers body surfaces like a metallic skin, targeting light reflections to further emphasize exterior character lines and design details.